For the first time in CS:GO history, a North American team won a Valve Major title. 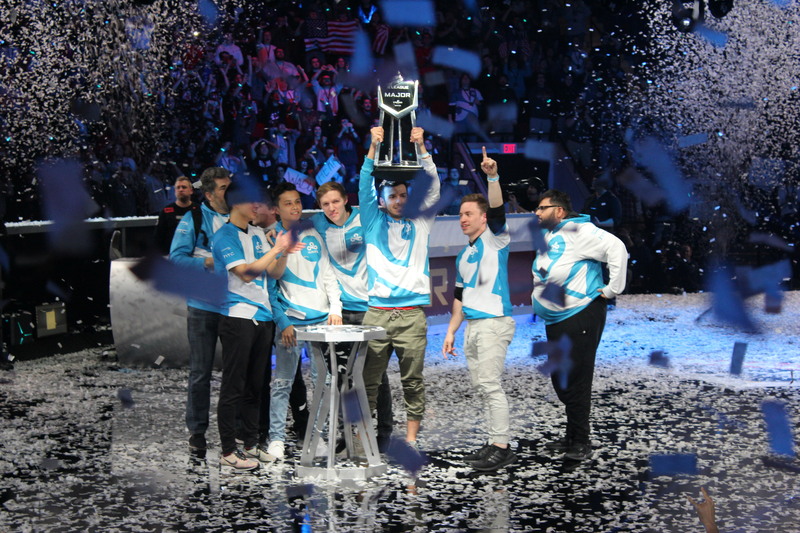 For the first time in Counter-Strike: Global Offensive history, a North American team have been crowned Valve Major champions, as Cloud9 defeated European supersquad FaZe Clan in the grand finals of the ELEAGUE Major: Boston earlier today. The two CS:GO teams, who both looked exceedingly strong heading into the event, battled for four hours across three maps in the grand final. Cloud9’s victory, however, seemed incredibly unlikely given the tenure of FaZe’s roster. The Boston crowd certainly had a lot to cheer for initially, at least, as Cloud9 made Mirage their playground. Seemingly nothing FaZe did on defense appeared to work, as both Tyler “Skadoodle” Latham and Timothy “autimatic” Ta completely obliterated FaZe. By the time FaZe could respond with a second round victory, Cloud9 had already established an 8-1 lead. While FaZe started mounting a comeback in the second portion of the first half, Cloud9 still pulled ahead with a solid 9-6 scoreline. But once the second half started, things started looking drastically different for both teams. Aside from a strong defense on the second round, FaZe won eight straight rounds. Cloud9 were then put in the awkward position of not only having lost the lead, but needing to force the map to an overtime scenario. Unfortunately for the home crowd, Cloud9’s response came too late—as FaZe completed the comeback and went into the second map of the series on tournament point. Cloud9 shocked FaZe on their own map pick, getting off to a tremendous 8-0 lead in the first half. The North American team consistently shut down any attempt by FaZe on either bombsite, and completely nullified star player Nikola “NiKo” Kovac—leaving him with only a few kills throughout the half. FaZe responded in some rounds, but never built off of their success, as Cloud9 ended the first half with a dominant 12-3 scoreline. The Europeans won the second pistol round, but Cloud9 quickly returned to their winning ways, as Skadoodle put the team on match point. While victory looked all but certain for Cloud9, FaZe staged the beginnings of a strong comeback—winning six rounds in a row until North America’s favorites finally closed Overpass out 16-10. The final map of the series, Inferno, initially looked to be going heavily in FaZe’s favor. In fact, after suffering a few early round losses, the Europeans came back to win seven rounds in a row. Cloud9’s best efforts saw the first half end 8-7 in favor of FaZe—but after a victory in the second pistol round, Cloud9’s hopes looked to be dwindling fast. FaZe eventually reached match point, but after attempting to end the game with two forcebuys, Cloud9 capitalized on the opportunity and forced the series to overtime. Almost immediately, Jake “Stewie2k” Yip put on a hero-level performance to secure the initial round of overtime. Their triumphant victory in the first round was followed by two more consecutive wins—meaning they only needed to win the opening round of the next half to leave Boston as Valve Major champions. FaZe had their share of heroics as well, however, and star AWPer Ladislav “GuardiaN” Kovács kept FaZe in the game after pulling off an absurd one-vs-two clutch. But as soon as Cloud9 saw an opening in the second half, the team jumped at the opportunity, dismantling FaZe at seemingly every turn, with miraculous defenses out of Skadoodle and Stewie2k once again securing them the lead. Unfortunately for GuardiaN, he couldn’t claim what came to be the deciding round of the tournament, and Cloud9 pushed through to victory. As such, Cloud9 have made history, as they became the first North American team to win a Valve Major, and defeated some of the world’s best teams on their way to the championship.